Having recharge problems? Want to find the best way to pay bills? Did you get Mobikwik yet? This popular online recharge portal will show you the quickest way to recharge and pay bills with just a click. What's more? You can use this to even save on your daily shopping. Yes, just get Mobikwik wallet today to save on your shopping with its amazing cashback on recharge, bill payments and more. All you have to do is add money in the wallet and enjoy this digital wallet to pay for all your shopping bills. This is how shopping on-the-go feels like plus you get to save. Download the app and use the promo codes now. Get flat Rs15 SuperCash on Recharge of Rs 99 or more done on MobiKwik App or website. Minimum amount spend to redeem the offer is Rs 99. The code can be Redeemed 2 times per user per month. Coupon redemption & Payment should be done on MobiKwik's Android, Windows(version 10 or above), iOS App or website. Offer valid for ALL MobiKwik users. The offer is NOT valid for operator AIRTEL. Recharge today. Mobikwik is offering flat Rs 30 SuperCash on Jio recharge of Rs 300 and above. Use this coupon code to get flat Rs 30 SuperCash. Users who have never recharged on MobiKwik can use the code NEWJIO & get flat Rs 130 SuperCash. Minimum amount spend to redeem the SuperCash is Rs 300. Maximum SuperCash is fixed at Rs 30. Coupon redemption and payment should be done on MobiKwik's Android, Windows and iOS App or website. The coupon code can be redeemed only once per user. Verified on 23/4/2019 .. Get 2% cashback, Upto Rs 300 SuperCash on Electricity Bill Payment done on MobiKwik App or website. Minimum amount spend to redeem the SuperCash is Rs 100. Maximum SuperCash is fixed at Rs 100. The code can be Redeemed once per user. Mobikwik offers flat 25% SuperCash on DTH Recharge done on MobiKwik App or website. Minimum amount spend to avail the offer is Rs 100. Maximum Supercash is fixed at Rs 100. The code can be Redeemed once per user. Coupon redemption & Payment should be done on MobiKwik's Android, Windows (version 10 or above), iOS App or website. Offer is valid for All MobiKwik users on All DTH operators except AIRTEL. Mobikwik is offering flat 5% SuperCash on recharge or bill payment of Rs.10 or more done on MobiKwik App or website. Minimum amount spend to avail the offer is Rs 10. Maximum SuperCash is fixed at Rs 500. The code can be redeemed once per user. Recharge now. 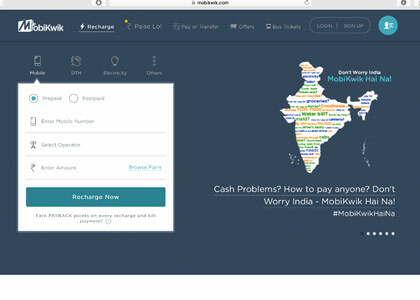 Mobikwik brings Flat Rs 150 SuperCash on Recharge & Bill Payment done on MobiKwik App or Web. Minimum amount spend to redeem the SuperCash is Rs 1500. Maximum SuperCash is fixed at Rs 150. The code can be redeemed only once per user. Get it now. New users can use this code to get flat Rs 50 SuperCash on Recharges or Bill Payment done on MobiKwik App or website. Minimum amount spend to redeem the SuperCash is Rs 10. The code can be Redeemed once per user. The code should be used on the first recharge only. Mobikwik is offering flat Rs 300 SupreCash on bus ticket booking. Use this coupon code to get flat Rs 300 SuperCash on minimum order value of Rs 750. Book now. The offer is applicable on all operators. Get 3% SuperCash on Prepaid Recharges done on MobiKwik App or website. Minimum amount spend to redeem the cashback is Rs.10. Maximum cashback is fixed at Rs.100. Minimum assured cashback is 2%. Assured 2% cashback to the users will be processed instantly. The code can be Redeemed once per user. Coupon redemption & Payment should be done on MobiKwik's Android, Windows (version 10 or above), iOS App or website. Offer is valid for All MobiKwik users on All operators except AIRTEL. Maximum Cashback amount is fixed at Rs.200. Coupon redemption & Payment should be done on MobiKwik's Android, Windows, iOS App or website. Offer can be redeemed only ONCE per user during the offer period. Do a DishTV DTH Recharge on MobiKwik App or website & get 25% SuperCash. Minimum amount spend to redeem the SuperCash is Rs 100. Maximum SuperCash is fixed at Rs 100. The code can be Redeemed once per user per month. Coupon redemption & Payment should be done on MobiKwik's Android, Windows (version 10 or above), iOS App or website. Offer is valid for All MobiKwik users on DISHTV DTH operator only. Flat 20% SuperCash On Vodafone Recharges! Get 20% SuperCash on Vodafone recharge done on MobiKwik App or website. Minimum spend to avail the offer is Rs 10. Maximum SuperCash is fixed at Rs 50. The code can be Redeemed once per user. The offer is applicable for all MobiKwik users on Vodafone mobile operator only. Get 50% SuperCash on Idea Unlimited Plan done on MobiKwik App or website. Get unlimited voice calls and up to 28 GB 4G/3G data for 28 days. Minimum transaction amount to avail the SuperCash offer is Rs 100. Maximum SuperCash is fixed at Rs 100. The code can be Redeemed once per user. The offer is applicable for all MobiKwik users on Idea prepaid operator only. Verified on 23/4/2019 .. Mobikwik Add Money offer: Get Flat Rs 40 Cashback On First Time Add Money by using the code. This is applicable on Mobikwik App. Minimum amount spend to redeem this is Rs 10. Get maximum Cashback amount of Rs 40. Code redemption & Payment should be done on MobiKwik's Android, Windows & iOS App. This can be redeemed only ONCE per New user. valid for NEW MobiKwik users. This code is not valid on Net Banking and Virtual Card payments. Get flat Rs.65 cashback on Add Money of Rs.10 or more done on MobiKwik App.. Enjoy total value worth Rs.75 (Rs.65 as cashback & Rs.10 added by you). Minimum amount spend to redeem the offer is Rs.10. Maximum Cashback amount is fixed at Rs.65. Coupon redemption & Payment should be done on MobiKwik's Android, Windows & iOS App. Offer can be redeemed only ONCE per user during the offer period. Offer valid for NEW MobiKwik users. The offer is not valid on Net Banking and Virtual Card payments. Get 10% SuperCash on All Jio plans on MobiKwik App or website. Minimum amount spend to redeem the SuperCash is Rs.10. Maximum SuperCash is fixed at Rs 100. Coupon redemption & Payment should be done on MobiKwik's Android, Windows, iOS App or website. Mobikwik add money offer is here! Add Rs 80 or more to your Mobikwik wallet and get flat Rs 20 instant cashback to your wallet. This coupon code is valid on Vodafone, Reliance, Reliance CDMA, Reliance GSM, Tata Indicom, BSNL Idea networks and lot more. This is applicable on Mobikwik android, iPhone, windows app only. Money should be added using credit card or debit card, and this cashback coupon is valid only once per user. Apply the code at checkout to avail the cash back. Get flat Rs.10 SuperCash on Add Money of Rs.100 or more done on MobiKwik App or website. Minimum amount spend to redeem the offer is Rs.100. Maximum Cashback amount is fixed at Rs.10. Coupon redemption & Payment should be done on MobiKwik's Android, Windows, iOS App or website. Offer can be redeemed only ONCE per user during the offer period. Offer valid for All MobiKwik users. The offer is not valid on Net Banking and Virtual Card payments. Limited Period Offer. MobiKwik has the right to end or call back any or all of its offer without prior notice. Verified on 23/4/2019 . Avail flat 10% cashback on all the mobile recharges and bill payments like DTH, utility bill payments, electricity bill payment, gas bill payments, postpaid bill payments and many more. This coupon code is applicable for both the old and new users, a user can get maximum cash back of Rs 200. Hurry up! Apply this above mentioned Mobikwik discount coupon code at checkout process. Get 100% Cashback on Add Money done on MobiKwik App. Minimum amount spend to redeem the offer is Rs.10. Maximum Cashback amount is fixed at Rs.65. Coupon redemption & Payment should be done on MobiKwik's Android, Windows & iOS App. Offer can be redeemed only once per user during the offer period. Offer valid for NEW MobiKwik users. The offer is not valid on Net Banking and Virtual Card payments. Limited Period Offer. Don't panic! Go cashless and enjoy a world of digital payments with MobiKwik! Use code: KWIKCASH to get upto Rs.100 cashback on Add Money done on MobiKwik App. Minimum amount spend to redeem the offer is Rs.10 Cashback will be processed basis 1% cashback on money added, maximum cashback is Rs.100 Coupon redemption & payment should be done on MobiKwik's Android, Windows & iOS App. Offer can be redeemed only ONCE per user during the offer period. The offer is not valid on Net Banking and Virtual Card payments. Limited Period Offer. Verified on 23/4/2019 .. Stand a chance to win 200% cashback on electricity bill payments done on MobiKwik App or website. 100 lucky users will get 200% cashback everyday. Maximum Cashback amount is Rs 200. Minimum amount spend to redeem the cashback is Rs 50 Coupon redemption & Payment should be done on MobiKwik's Android, Windows, iOS App or website. The code can be redeemed any number of times. Cashback will be processed within 10 days. Get flat Rs 50 Cashback on Add Money of Rs. 50 or more done on MobiKwik App. Maximum Cashback amount is fixed at Rs 50. Minimum amount spend to redeem the offer is Rs 50. Coupon redemption & Payment should be done on MobiKwik's Android, Windows & iOS App. Offer can be redeemed only once per user during the offer period. This offer is valid only for new MobiKwik wallet users. The offer is not valid on Net Banking and Virtual Card payments. Limited Period Offer. Get flat R .50 cashback on your 1st Recharge done on MobiKwik App. Minimum amount spend to redeem the cashback is Rs 50.Maximum cashback is fixed at Rs 50. User should be new to MobiKwik & it should be the first transaction of the user. The code can be Redeemed only once per user. Sign-up, Coupon redemption & Payment should be done on MobiKwik's Android, Windows (version 10 or above) or iOS App. Coupon code "FIRST" needs to be applied on the recharge screen & not the credit/debit card payment screen. Payment method should be Credit or Debit card only. Offer is valid on All operators except AIRTEL. Cashback will be processed within 24 hours. Limited Period Offer. Get 200% Supercash on Add Money done on MobiKwik App. Minimum amount spend to redeem the offer is Rs 10. Maximum Cashback amount is fixed at Rs 65. Coupon redemption & Payment should be done on MobiKwik's Android, Windows & iOS App. Offer can be redeemed only ONCE per user during the offer period. Offer valid for NEW MobiKwik users. The offer is not valid on Net Banking and Virtual Card payments. Limited Period Offer. Get 20% Cashback on your first Add Money done on MobiKwik Android, iOS, Windows App. Maximum Cashback amount is fixed at Rs 50. Minimum amount spend to redeem the offer is Rs 10. The offer is not valid on Net Banking and Virtual Card payments. Coupon Redemption and Payment should be done on MobiKwik's Android, iOS or Windows App. Offer can be redeemed only ONCE per user during the offer period. Offer valid for NEW MobiKwik users. Get flat Rs 100 Cashback on "Add Money" done on MobiKwik iOS App. Maximum Cashback amount is fixed at Rs.100 Minimum amount spend to redeem the offer is Rs 200. Sign Up platform, Coupon Redemption and Payment should be done on MobiKwik's iOS App. Offer can be redeemed only ONCE per user during the offer period. Offer valid for NEW MobiKwik users. Limited Period Offer. Get flat Rs.1 Cashback on Recharge of Rs. 10 or more done on MobiKwik App or website. Minimum amount spend to redeem the offer is Rs 10. The code can be Redeemed 5 times per user per month. Coupon redemption & Payment should be done on MobiKwik's Android, Windows(version 10 or above), iOS App or website. Offer valid for ALL MobiKwik users. The offer is NOT valid for operator AIRTEL. Get flat Rs. 50 Cashback on Add Money of Rs. 50 or more done on MobiKwik App. Maximum Cashback amount is fixed at Rs.50, Minimum amount spend to redeem the offer is Rs.50. Coupon redemption & Payment should be done on MobiKwik's Android, Windows & iOS App. Offer can be redeemed only ONCE per user during the offer period. Offer valid for NEW MobiKwik users. The offer is not valid on Net Banking and Virtual Card payments. Limited Period Offer. Verified on 23/4/2019 .. Get 5% SuperCash on Punjab State Power Corporation Limited (PSPCL) when you pay through MobiKwik. Maximum SuperCash is fixed at Rs 200. The code can be Redeemed once per user per month. Coupon redemption & Payment should be done on MobiKwik's Android, Windows (version 10 or above), iOS App or website. Get 200 Payback points on Add Money of Rs. 50 or more done on MobiKwik App. Users will get flat 200 Payback points in their registered Payback account. Minimum amount spend to avail the offer is Rs.50. Coupon redemption & Payment should be done on MobiKwik's Android, Windows & iOS App. Offer can be redeemed only ONCE per user during the offer period. Offer valid for NEW MobiKwik users. The offer is valid on all payments made from credit or debit cards. The offer is not valid on Net Banking and Virtual Card payments. Limited Period Offer. Users who redeemed the code in February will receive the Payback points by 15th of March 2017. Get 2% cashback on Add Money of Rs.10 or more done on MobiKwik App or website. Minimum amount spend to redeem the offer is Rs.10. Maximum cashback amount is fixed at Rs.100. Coupon redemption & Payment should be done on MobiKwik's Android, Windows, iOS App or website. Offer can be redeemed only ONCE per user during the offer period. Offer valid for All MobiKwik users. The offer is not valid on Net Banking and Virtual Card payments. Limited Period Offer. MobiKwik has the right to end or call back any or all of its offer without prior notice. Get 10% SuperCash on bill payments of Hathway Digital TV done on MobiKwik App or website. Maximum SuperCash amount is Rs.100. Coupon code redemption and payment should be done on MobiKwik's Android, iOS App and Windows or website. The promo code can be redeemed only once per user. Limited period offer. The offer is applicable on operator Hathway Digital TV only MobiKwik has the right to end or call back any or all of its offer without prior notice. Get flat Rs.25 cashback on gas bill payments of Indraprastha Gas Limited done on MobiKwik App or website. Maximum Cashback amount is Rs.25. Minimum amount spend to redeem the cashback is Rs.400. The promotional code can be redeemed only once per user. Limited period offer. The offer is applicable on operator Indraprastha Gas Limited only. Get 5% cashback on recharge & bill payments of done on MobiKwik App or website. Minimum amount spend to redeem the cashback is Rs.10. Maximum Cashback is fixed at Rs.50. Terms and conditions apply. Limited period offer. The offer is applicable on all operators. Get 10% cashback on Reliance postpaid bill payment done on MobiKwik App or website. Minimum amount spend to redeem the cashback is Rs.10 Maximum cashback is fixed at Rs.30 The code can be Redeemed once per user. Coupon redemption & payment should be done on MobiKwik's website, Android or iOS App. The code can be redeemed only once per user. The offer is applicable on operator Incable Digital TV only. Coupon redemption & payment should be done on MobiKwik's Android App. The code can be redeemed only once per user. Limited period offer. The offer is applicable on operator Hathway Broadband only. Get 5% SuperCash on bill payments of Spectranet Broadband done on MobiKwik App or website. Minimum amount spend to redeem the SuperCash is Rs.100 Maximum SuperCash is fixed at Rs.200. Coupon redemption & Payment should be done on MobiKwik's Android, Windows, iOS App or website. The offer is applicable on operator Spectranet Broadband only. Get 10% SuperCash on Mobile Postpaid & Electricity Bill Payments done on MobiKwik App or website. Minimum amount spend to redeem the SuperCash is Rs 100. Maximum SuperCash is fixed at Rs 100. The code can be Redeemed once per user. Get flat Rs.29 SuperCash on Jio Rs.509 plan on MobiKwik App or website. Minimum amount spend to redeem the SuperCash is Rs.509. Maximum SuperCash is fixed at Rs.29. Offer is applicable for only Jio Prime users. Limited period offer. The offer is applicable on operator Jio only. Terms & Conditions apply. Get flat Rs.19 SuperCash on Jio Rs. 309 plan on MobiKwik App or website. Minimum amount spend to redeem the SuperCash is Rs.309. Maximum SuperCash is fixed at Rs.19. Coupon redemption & Payment should be done on MobiKwik's Android, Windows, iOS App or website. The code can be redeemed only once per user. Offer is applicable for only Jio Prime users. Limited period offer. The offer is applicable on operator Jio only. Get flat Rs.30 SuperCash on MTNL Delhi 319 plan done on MobiKwik App or website. Get unlimited voice calls in MTNL Delhi & Mumbai network, free 25 minutes every day on other networks and 2 GB 2G/3G data every day for 28 days. Minimum amount spend to redeem the SuperCash is Rs.319. Maximum SuperCash is fixed at Rs.30. The code can be redeemed once per user. Coupon redemption & Payment should be done on MobiKwik's Android, Windows(version 10 or above), iOS App or website. The offer is applicable for all MobiKwik users on MTNL Delhi prepaid operator only. Limited Period Offer. Get flat Rs.38 SuperCash on Jio Rs.608 plan on MobiKwik App or website. Minimum amount spend to redeem the SuperCash is Rs.608. Maximum SuperCash is fixed at Rs.68. Offer is applicable for Non-Prime & new Jio users. With recharge of Rs.608, get Jio Prime & Unlimited data & free calls for 3 months. Limited period offer. The offer is applicable on operator Jio only. Get flat Rs.28 SuperCash on Jio Rs.408 plan on MobiKwik App or website. Minimum amount spend to redeem the SuperCash is Rs.408. Maximum SuperCash is fixed at Rs.48. Code can be redeemed only once per user. Offer is applicable for Non-Prime & new Jio users. With recharge of Rs.408, get Jio Prime & Unlimited data & free calls for 3 months. Limited period offer. The offer is applicable on operator Jio only. Get flat Rs 30 SuperCash on BSNL Rs 339 plan done on MobiKwik App or website. Get unlimited voice calls in BSNL network and 2 GB 4G data per day for 28 days. The plan is fixed at Rs 339. Maximum SuperCash is fixed at Rs 30. The code can be Redeemed once per user. Coupon redemption & Payment should be done on MobiKwik's Android, Windows(version 10 or above), iOS App or website. The offer is applicable for all MobiKwik users on BSNL prepaid operator only. MobiKwik has the right to end or call back any or all of its offer without prior notice. Get flat Rs.30 SuperCash on Vodafone 346 plan done on MobiKwik App or website. Get unlimited voice calls in Vodafone network and 1 GB 4G data per day for 28 days. The plan is fixed at Rs.346. Maximum SuperCash is fixed at Rs.30. The code can be Redeemed once per user. Coupon redemption & Payment should be done on MobiKwik's Android, Windows(version 10 or above), iOS App or website. The offer is applicable for all MobiKwik users on Vodafone prepaid operator only. Offer is valid till 15th April. MobiKwik has the right to end or call back any or all of its offer without prior notice. Maximum SuperCash amount is fixed at Rs.200. Coupon redemption & Payment should be done on MobiKwik's Android, Windows, iOS App or website. Offer can be redeemed only ONCE per user during the offer period. Get 50% SuperCash on your TSRTC Bus Ticketing done via MobiKwik Web. No Min transaction required. Maximum MobiKwik SuperCash is Rs. 250. Code can be redeemed TWICE per user. SuperCash will be auto-credited to your MobiKwik wallet within 24 hours of bus ride completion. Verified on 23/4/2019 . Get 50% SuperCash on your Bus Ticket booking done via MobiKwik Web. No minimum transaction value is required. Maximum SuperCash is Rs 250. Offer code can be redeemed TWICE per user. Cashback will be auto credited to your MobiKwik wallet within 24 hours of bus ride completion. Book now. Get 50% SuperCash on your Bus Ticketing done via MobiKwik Web. No Min transaction required. Maximum MobiKwik SuperCash is Rs. 250. Code can be redeemed TWICE per user. SuperCash will be auto-credited to your MobiKwik wallet within 24 hours of bus ride completion. Get flat 15% SuperCash on Electricity, Postpaid, Gas & Utility Bill Payment done on MobiKwik App or website. Minimum amount spend to redeem the SuperCash is Rs 150. Maximum SuperCash is fixed at Rs 100. The code can be Redeemed once per user. Offer is valid only for new MobiKwik users. Here are the exciting Mobikwik coupons for DTH new users: Flat 15% cashback on prepaid DTH recharges. Maximum cashback a user can avail Rs. 100 per transaction on a minimum transaction amount of Rs. 100 and above. Apply the above mentioned coupon code at checkout process to avail the offer. Get 50% SuperCash on your Bus Ticketing done via MobiKwik's Android or iOS App or Web. No Min transaction required. Get flat Rs 49 SuperCash on Jio Rs 399 Recharge Plan on MobiKwik App or website. Minimum amount spend to redeem the SuperCash is Rs 399. Maximum SuperCash is fixed at Rs 49. The code can be redeemed only once per user. Offer is applicable for Jio Prime users. With the recharge of Rs.399, get 84 GB data & free calls for 84 days. Get flat 5% SuperCash on Landline or Broadband Bill Payment done on MobiKwik App or website. Minimum amount spend to redeem the SuperCash is Rs 100. Maximum SuperCash is fixed at Rs 100. The code can be Redeemed twice per user per month. Offer is valid for all MobiKwik users on All Landline or Broadband operators except AIRTEL. Get 15% SuperCash on recharge of Reliance Big TV done on MobiKwik App or website. Minimum amount spend to avail the offer is Rs 100. Maximum SuperCash is fixed at Rs 75. The code can be Redeemed once per user. Recharge now. 3. Share the picture of the recipient with their profession/title/use-case on twitter/facebook with hashtag #MobileNumberLoPaiseDo & #MobiKwikHaiNa, also tag @MobiKwik on Twitter/Facebook. 4. Send us your email-Id, registered number and link to the tweet/post at [email protected] with subject name "MobiKwikHaina"
Check more details in the landing page. Here is the exciting recharge offers for Mobikwik wallet old users. Make your payments through Mobikwik wallet and get Rs 150 cash back on Delhi Jal Board. A user can get maximum cash back of Rs 50 per transaction, this is valid for one transaction per user every month. This Mobikwik cashback offers is applicable only on DJB msewa android app. Cash back will be auto credited to your Mobikwik wallet within 24 hours today! Get flat Rs.9 SuperCash on Aircel prepaid recharge done on MobiKwik App or website. Minimum amount spend to redeem the SuperCash is Rs.69. Maximum SuperCash is fixed at Rs.9. The code can be redeemed once per user. Offer is valid for all MobiKwik users on operator Aircel prepaid for region Delhi NCR & Karnataka only. Do a DTH Recharge on MobiKwik App or website & get upto 100% cashback. Apply discount code at check out page. Minimum amount spend to redeem the cashback is Rs.100. Maximum cashback is fixed at Rs.100. Minimum assured cashback is 3%. Assured 3% cashback to the users will be processed instantly. The extra cashback (upto 100%) to the lucky users will be processed by 10th of next month. The code can be Redeemed once per user. Coupon redemption & Payment should be done on MobiKwik's Android, Windows (version 10 or above), iOS App or website. Offer is valid for All MobiKwik users on All operators. Verified on 23/4/2019 . Book with only 20% of your bus fare with MobiKwik. This option is only available on MobiKwik's latest Android app (v.8.4+) & IOS App (v7.3). On bus rides wherever applicable, click the check box for 'partial booking'. Option available on all routes and buses, subject to cancellation policy. Cash pickup option is available for partial bus bookings (with minimum 20% of bus fare). Ticket will be issued on completing the full payment. Balance to be paid before the due date and time which will be informed when ticket is booked. Ticket will be issued once the full amount is paid. If balance amount is not paid before the defined date & time ticket will be cancelled and 20% amount will be refunded. All cashbacks will be auto-credited to your MobiKwik wallet within 24 hours of bus ride completion. Get 50% cashback on Jugnoo when you pay via MobiKwik. Maximum SuperCash that can be availed is Rs. 50. No SuperCash code is needed to avail the SuperCash. Offer valid for new users to MobiKwik only. Invite your friends to install & add money on the MobiKwik App. On every new friend who installs from your referral link & adds Rs.50 in MobiKwik, you get Rs.50 your friend gets Rs.50 too. Please note that your friend should use your invite link for installing the MobiKwik App. You can earn up to Rs.40000 when all 800 friends of yours add Rs.50 on MobiKwik. Check more details in the landing page. Verified on 23/4/2019 .. Mobikwik landline bill payments offer: Get upto 100% cashback on your bill payment. Choose from airtel landline, bsnl, reliance, mtnl & more. Check more details in the landing page. Pay now. Get Flat Rs. 350 SuperCash @ Central stores using MobiKwik. Minimum transaction to avail SuperCash is Rs.5000. Offer valid on Sundays only, once per month. No cashback code required to avail the offer. Flat 4% cash back on Airtel Prepaid Mobile Recharge for Rs 20 and above. Maximum cash back is Rs 40. This promo code for postpaid bill payment Airtel is valid for 1time/user. Valid for both old and new users. Get 7% Cash back on DTH recharge for all users by using Mobikwik wallet. This Mobikwik coupon code is applicable on a minimum DTH recharge amount of Rs. 200, a user can get maximum cash back of Rs. 70. This offer is valid on various DTH networks like Airtel DTH, Tata Sky DTH, Dish TV Videocon D2H, Sun direct, Reliance Big TV and more. This Mobikwik discount coupon code is applicable only for one time per user. Hurry up! Mobikwik wallet offer today for old user! Get 5% cash back on Rs 20 and also get free mobile recharge. Valid for all operator's prepaid recharges except Airtel. This code is applicable on Idea, Vodafone, Aircel, Reliance, BSNL and many more networks. Valid for both Old and New users and once/user. You can also make your Airtel online recharge using Indian Bank Maestro Debit card or credit card. Download Mobikwik App now for free and offers on mobile recharge for old users! Avail flat 20% cash back on Electricity, Insurance and Gas Bill Payments by using this code. Minimum transaction amount is Rs 400 and maximum Cash back is Rs 100. Valid for Mobikwik New Users only. This is valid on various electricity operators like BSES Rajdhani, BSES Yamuna, MSEB Mumbai, Tata power delhi distribution limited, Reliance energy Mumbai, Best Mumbai and lot more. Pay Now. Hurry up.!! Exciting coupons for old and new users: Mobikwik is offering flat 5% cash back on Electricity, Insurance and Gas Bill Payments and also get free recharge on all your bill payments. This Mobikwik coupon is valid only on a minimum transaction value of Rs. 400 and a user can get maximum cash back of Rs. 60. This is valid only one time per user. This is valid on various insurances like: Birla sun life insurance, ICICI Prudential life insurance, Tata AIA life insurance and many more. Hurry up!!! Grab this Mobikwik code before it expires. With the advent of online shopping there are several brands that are making their services and products available online, enabling people to make the most of the online offers and discounts. One such brand that has gained immense popularity and positive feedback is Mobikwik. Simply put, Mobikwik is an Indian company that was founded way back in 2009 and it offers a mobile phone based payment system along with an online wallet. Here the customers add their money to the online wallet that can be made use for payments. Back in the year 2013, it was the Reserve Bank of India, that has authorized the brands usage of the Mobikwik wallet. It was in May 2016 that this company had also started to offer small loans to its customers as a part of its service. This company had also launched the Mibikwik Lite mobile app, back in November 2016 that was designed for the 2G mobile networks for selected regions having very poor mobile connectivity. Back in November 2016, this company had recorded having as much as 1.5 million merchants making use of its service. Furthermore, the use base is now of 55 million customers. However, the company is always trying to come up with some of the best ideas to sell its service offerings better. In the recent times to woo in more and more customers, the brand has come up with Mobikwik coupons that can be accessed easily from the online coupon portals such as HappySale. Even though online shopping is in an upswing now, there are many facets of online shopping that most people haven’t woken up to. One of this is making the most of the online deals in order to cater to the everyday chores and fulfil the same at best and also gain a good discount for the same. For example, are you still getting your recharges done offline and paying your bills offline as well? If yes, then you can switch the same to online and can get great discounts for doing that. Don’t believe us! Check-out the MobiKwik offers & promo codes that have been put on offer in HappySale and that have some great offers for you. As a brand Mobikwik has been doing good business for a while now and has gathered a huge customer base. This website is popularly called as a leading online recharge portal and directs on the smart techniques for paying bills and getting your recharges done fast and completely safe. All the customers have to do is get a Mobikwik wallet and save great as they shop, pay bills or recharge by making good use of the cash back offers. This is one of the new age ways to shop more with less cash and get good discounts. How to get the Mobikwik discount deals online? For those who are the first time users of this online wallet, let us assure that the process is simple and easy. Once you have successfully created your online wallet with this website you simply have to browse through HappySale in order to check out the wide range of deals and discount codes that have been placed on offer and then decide which one to opt in for. Each of the Mobikwik discount codes in HappySale comes with a description that allows the readers to read through the deals in order to know whether or not to opt in for this deal. That aside, the deals also have a “Show Code” option, that allows them to click on the same and get a code. Now this code needs to be kept handy as when you check out from the website, post your discount deal selection you need to copy and paste this code whilst making the billing in order to claim your discount deal. For the best deals on Mobikwik depending on HappySale is a good decision. Here you have the chance to select from deals like “Best Price” where when you pay bills or recharge for Rs.100 or more and have the chance to win free 2 Uber rides. However, the minimum amount needs to be of Rs.100 and this deal is valid until December 31st and is applicable on every operator. Then there are other deals like “Upto Rs.150 cash back” where you have the chance to save Rs.150 on your train tickets as you pay through your Mobikwik wallet. Using the Mobikwik coupon codes and other discount codes, you truly switch to become a new age and cyber savvy online shopper from a random one. This kind of shopping is going to be the face of online shopping today where the deals and discounts are more and the online shoppers don’t have to struggle to make the payments or get their recharges done offline and waste time, when the same can be done online, within minutes and from the comfort zone of one’s room. So go and grab your best deals at HappySale today. There are countless deals and offers and on HappySale that you can browse and book. There are the ones that are meant for the new users, which are provided to encourage more new users. However, if you have been searching for the best, latest and pocket-friendly offers then all you have to do is keep on browsing through HappySale as that’s a smart call. This is one of the best websites for the deals and discounts and lists down only the valid ones. You can browse and select the offer that fits your budget and preference, read more on the same from deal description so that you can gain clarity on the same and then activate it prior to the expiry date. The offers keep changing on a recurrent basis enabling you to have access to the best deals.